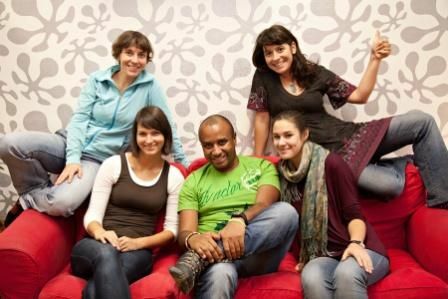 The Zeppelin Hostel is one of the best small hostels in Ljubljana ran by a team of avid travellers. We are one of the closest hostels to the main train/bus station, less than 5 min walking. We are located in the centre of Ljubljana in the famous building called Evropa from the XIX century. Just across the street you will find the historical town, lively river side full of bars and the main tourist attractions. Our hostel is a pleasant place to rest and meet other guests. A recently refurnished comfy common room with plasma TV and guest kitchen will make you feel inspired all the time and allow you to mingle with other travelers. We are also one of the few hostels where BREAKFAST IS INCLUDED in the price. Other features of Zeppelin hostel are: - Free WiFi and internet access on our computers- Linen included in the price- Reading lamp for each bed- Laundry room- Book exchange library- Kitchen facilities (cooking stove, microwave, fridge,)- Free towels in double rooms - Free lockers- No curfew- Free advice on local sights, nightlife and traveling Cleanliness and outstanding service are the top priorities of our staff. WE ARE EXPERTS IN TREKKING and OUTDOOR ACTIVITIES for SLOVENIA and the western BALKANS, so we will be happy to share some advices or help you organize a tour. Breakfast, linens and VAT are included in the price. Tourist Tax (1,01 EUR/person/night) not included.THE RECEPTION IS OPENED FROM 8am TILL 10pm. If your ARRIVAL TIME is AFTER 10pm we can organize a LATE CHECK-IN free of charge. Please inform us about your EXACT arrival time. We can wait for you for 30 min. In case you are arriving 30 MIN after the agreed time, we will need to charge you 10 EUR/additional hour. (maximum waiting time is 2 hours)___________________________________________IMPORTANT!!! Please inform us about your arrival time. If you do not arrive 3 hours after your arrival time your booking will have to be cancelled. If you need a LATE CHECK-IN please inform us in advance. The Zeppelin Hostel is located in Slovenska street 47 that is the main avenue of Ljubljana. If you are coming from the main train/bus station, just take RIGHT to Masarykova street and turn LEFT at the big crossroads to Slovenska street. After a few min walk, you will see a white historical building on your right handside, check for number 47 and enter inside the passage (our hostel's sign is on the entrance of the passage). Once inside the passage take the second right glass door. You can ring the bell there. Hostel is located on the 2nd floor. This will take you less than 5 min walking.If you are coming by plane, a shuttle bus from Ljubljana airport to the main bus/train station is available. Check timetables on http://www.lju-airport.si/en/passengers-and-visitors/getting-here/bus-and-shuttle/If you are coming by car first get on the Ljubljana ring and then take the exit Lj.BEZIGRAD, turn to DUNAJSKA street, direction CENTER and you will arrive directly to Slovenska street. We'd like to inform you that for driving in the Slovenian highways you will need to buy the 'vignette' in any gas station before getting into Slovenia. More information: http://www.slovenia.info/?by_car=0&lng=2The reception opens from 8am to 10pm. If your ARRIVAL TIME is AFTER 10pm we can organize a LATE CHECK-IN free of charge. Please inform us about your EXACT arrival time. We can wait for you for 30 min. In case you are arriving 30 MIN after the agreed time, we will need to charge you 10 EUR/additional 90 minutes. (maximum waiting time is 2 hours)---------------------------------------------------------------------------------IMPORTANT!!! We CANCEL YOUR BOOKING 3 hours after your original arrival time. If your arrival time changes please inform us about it.In case of not showing, first night will be charged on the credit card.